Jean Frank considers herself a miracle, even though she’s had more bad luck than you could ever imagine. She and her older sister Guta survived four years in the hell of Nazi concentration camps. Her parents, a brother and her other sister perished in the Shoah. Two years ago, she had to endure the agony and trauma of the death of one of her sons, Mike. All three of her husbands have passed on. Her birthday is an ominous one: September 11. While in the concentration camp, she was forced to have an abortion. Shortly after liberation, she suffered a stillbirth and endured the barbarism of drunken Russian soldiers. The list goes on and on. So how can Frank be considered lucky considering all the blood and violence etched in her memory? Why does she think she’s a miracle? And how does she maintain a terrific sense of humor? 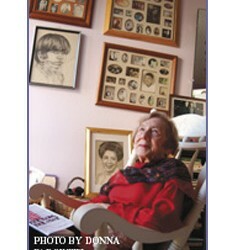 “I’m a miracle because I survived to tell my story and to follow my dreams,” says Frank, from her apartment, where she is collecting the archives of her life in a room she calls the “Mitzvah room.” The room is stuffed with family picture albums, clippings of the hundreds of articles written about her and a portrait of her father which, she says, “gives me the strength to go on.” Her legacy – as a survivor, poet, lecturer and humanitarian – will soon be preserved at the San Diego Historical Society. 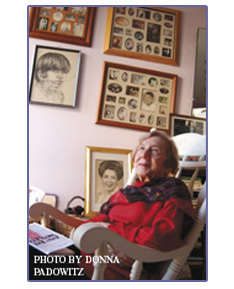 Born in Poland in the 1920s, she doesn’t know exactly how old she is, but her memories of events long ago are still hauntingly lucid. Frank’s story is more than about survival; it’s about how to live life to the fullest and be a compassionate human being, in spite of vicious hatred. “There’s always somebody who has less than you,” says Frank. “My father taught me when I was a little girl that it means more to give when you have nothing.” Frank was in her early teens when she was forced into the Warsaw Ghetto. “I know what it’s like to be hungry and homeless,” she says. If you want to hear Frank’s story, she’d be delighted to talk to you at length, provided she isn’t busy with one of her humanitarian projects or boxing up her life’s mementos. Frank will gladly cook you a vegan meal (she has not eaten an animal product in nearly 20 years), but she won’t let you in the kitchen, because she plays the role of consummate Jewish mother. She’ll cook you a meal with love because she doesn’t want anyone to go hungry. She’ll read you some of the thousands of poems she’s written, in English, Polish and Italian. She’ll lament about the failed relationships of her friends and offer you Dr. Ruth-like dating advice. Several of Frank’s poems are about the blessings of living in America, such as her poem about the Statue of Liberty. “It’s not that people forget, it’s that people take it for granted,” she says. Fluent in five languages, Frank also wrote a book, Not Now, Not Ever, a poignant, harrowing and masterfully written first-hand account of her experiences during the war. It is a testament to her determination to survive. Written in 1967, the book is even more of an astonishing feat considering it was Frank’s first major attempt at writing in English (she didn’t learn the language until her arrival in America in 1950). Not Now, Not Ever is richly detailed. In the book, she recollects every square inch of her family’s living quarters as well as the ghastly confines of the camps. She contrasts the bright and joyous hues of a sunny day with the darkness of oppression, hate and death. “In the book, I describe what was taken away, such as childhood and tradition, like Shabbos and Passover,” she says. She has given talks at schools like La Jolla’s Bishops School, where she speaks about the importance of tolerance and expressing love to those closest to us. Frank has also received Leadership Awards from San Diego television stations such as KUSI. Frank will never recover from the loss of her son, but she is now starting to get on with her life again. She contacted the San Diego Historical Society with the purpose of allowing her story to live on. John Panter, archivist for the Historical Society, is helping Frank collect the hundreds of articles written about her, as well as family photos, and letters from loved ones and people she has fed and clothed. It’s no easy task, but Panter realizes how rare it is to find a life story such as Frank’s. It’s amazing that Frank has persevered and not gone crazy, or worse. What’s even more extraordinary is that Frank has let love rule. It would be so easy for her to be bitter. She still can sob when talking about the past, but her vigor, her sense of humor and her passion to make a difference in people’s lives keep her going strong.